Barrow has just three platforms, two of then on an island. My train leaves from platform 2, though there are no station announcements and the electronic signs don't seem to be working. The station has been rebuilt in recent years and doesn't seem to have much character. As we leave we pass a mixture of modern and old housing on the left and the shipyards on Barrow Island on the right. We then pass a region of dark, derelict buildings and the track starts to turn to the left, going in a northerly direction. We then make our first stop at Roose, which has also been completely rebuilt in recent years, with new platforms and shelters with pay phones in them. We pass some wheat fields on the left and then enter a cutting. We pass through a short tunnel and then pass the remains of Furness Abbey and a factory, and then we join up with the Barrow by-pass line on the left. We pass through another tunnel and then stop at Dalton-in-Furness soon after. The original station building is still there, though it is now a private dwelling. It is a nice station with a blue-framed shelter on the left hand platform and a brick shelter on the right side. We continue to go in a Northeasterly direction as we climb away from Dalton. We enter another cutting and then a tunnel, before emerging into a moorland landscape, with both sheep and cattle grazing in the fields. We continue to climb as the track twists to the right and we go into another cutting, doing about 40 mph. We pass under the A590 and then slow as we come into Ulverston station, passing a signal box and sidings on the left. This has a marvelously restored red brick station building, complete with tower! There are three platforms, two of them on an island. There is a plaque here commemorating something. We leave high above the town with a hill and a tower on the left. We cross over a canal, which leads out to the sea in the distance. We then see the Southern Fells of the Lake District on the left and the remains of the old line to Coniston leaves us on the left. We then cross the Leven viaduct over the estuary of the River Leven, which drains from Lake Windermere and Coniston Water. You can now see the outline of Heysham nuclear power station in the distance across Morecambe Bay. Once we have crossed the estuary, we pass a large expanse of flat marshland on the right. On the opposite side is a large expanse of forested area and the Holker Hall estate on a hillside. We reach about 50 mph, before we slow down and go into a cutting. We emerge at Cark & Cartmel station, which is now simply called "Cark". There is a nice station house on the Barrow platform and a brick shelter on the Lancaster platform. The lower part of the station house is boarded up, but the upper part looks lived in. The original footbridge is still in place as well. We go back into a cutting and then emerge into more fields with cattle grazing in them. We are going South East now, but change to the North East again, travelling right next to the sea, as we get a great view of the Lancashire fells and Yorkshire Dales on the eastern horizon. We then stop at Kents Bank, which has a nice original station house and a smaller brick shelter on the Barrow platform. We are close to marshland on the right now and a hillside on the left. Then many houses appear as we come into Grange-Over-Sands station, which is next to a promenade on the right, busy with walkers. It's a very busy station, with about thirty passengers waiting to get on, causing the train to fill up now. It has a lovely station house, which has been fully restored with a cafe in it. There's a large shelter on the Barrow side and you get nice views out across the estuary from its windows. 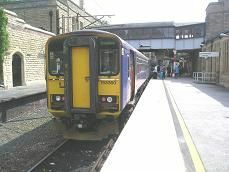 The station signs say First Trans-Pennine on them as opposed to the previous Northern ones. We pass sheep grazing in the marsh land below us on the left and you can see more of the Southern Lakeland Fells as we cross over the estuary of the River Kent, with views of Arnside on the opposite bank. We slow down to about 30 mph, as we go over the viaduct, which rattles with the weight of the train. You can see several identical houses on the right bank, all coloured in Cumbrian slate grey. We pass a signal box and then come into Arnside station. It has a 1960's style red brick station building, as well as two stainless steel shelters, plus the original blue and white footbridge. We now move away from the coast and go inland, passing through wooded areas. You can see the remains of a castle on a hill on the right and an old quay below it. It is now more hilly and wooded now. The driver keeps sounding his horn as we pass a succession of foot crossings on the line. We then come into Silverdale, which has a very large grey stone station building, which is now split into two private dwellings. There is a sign, which says, "Sunny Silverdale - the loveliest spot on Morecambe Bay". The station sign is now Northern, coupled with Lancashire County Council this time. The land becomes flat once more and Heysham Power station looks much closer than before. There is marshland on both sides of the track and I notice some wading birds in the pools here. We then move inland again, seeing Morecambe in the distance on the right and sidings appear on both sides of the track. The line from Leeds joins us on the left as overhead electric gantries appear by the trackside. We approach Carnforth station, with "Steam Town" on the right, with some preserved diesels and some old red LMS carriages in the sidings. Carnforth station is encased in white concrete walls and is now separate from the West Coast Main Line, which we join just after the station. We pass more sidings on the right; full of old carriages, some of which are covered in graffiti. We see some hills on the left and a caravan site as we speed up to about 70 mph. There are houses on the left now and we can see the sea on the right. You can now look out across Morecambe Bay to see the hills we have just come from. You can see the town of Morecambe on the right now as we pass the two lines in and out of Morecambe and we start to slow as we see the town of Lancaster appearing on both sides of the line now. We cross over the River Lune and then slow as we come into Lancaster station. It has six platforms and has its original yellow brick buildings looking in good order.